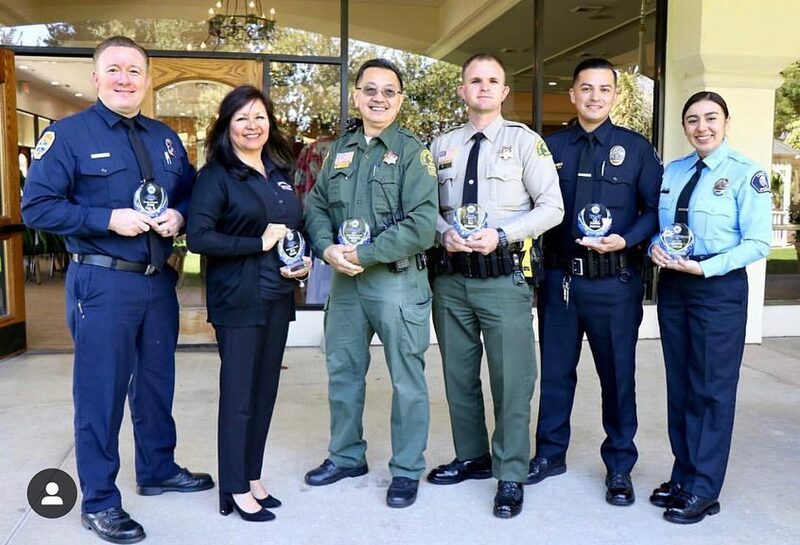 On Thursday, March 14 the Chino Valley Chamber of Commerce and business community honored the outstanding people of our Chino Valley Fire District, Chino Hills Police Department and Chino Police Department at our annual Salute to Public Safety Luncheon. Each agency chose two representatives to honor at our 2019 Salute to Public Safety that have gone above and beyond the call of duty. Thank you for the fine work you have done to serve and protect the citizens of the Chino Valley. We are grateful. Alma is an Administrative Secretary who has been a resident of Chino Hills for 30 years. She grew up in Los Angeles and attended Mt. San Antonio College, Chaffey College and Cal Poly Pomona. Prior to her position as an Administrative Secretary to Emergency Services and Support Services, she was our Permit Technician for 11 years. She is married to Jim Nielsen and has 4 children: Janine, Richard, Jackie, and Jennifer. She has 3 grandsons, Benjamin, Andrew and William. Alma enjoys traveling, boating, Yoga, shopping and of course, Napa. Congratulations Alma, on being selected as the 2018 Employee of the Year! JR, a Firefighter / Paramedic, is an 11 year veteran of the Fire District. JR and his wife, Bree reside in the City of Upland. JR grew up in Rancho Cucamonga and graduated from Etiwanda High School. He attended Mt. San Antonio College and Crafton Hills College. Prior to his position with Chino Valley Fire, JR worked for the City of La Verne for three years as a Firefighter/Paramedic. 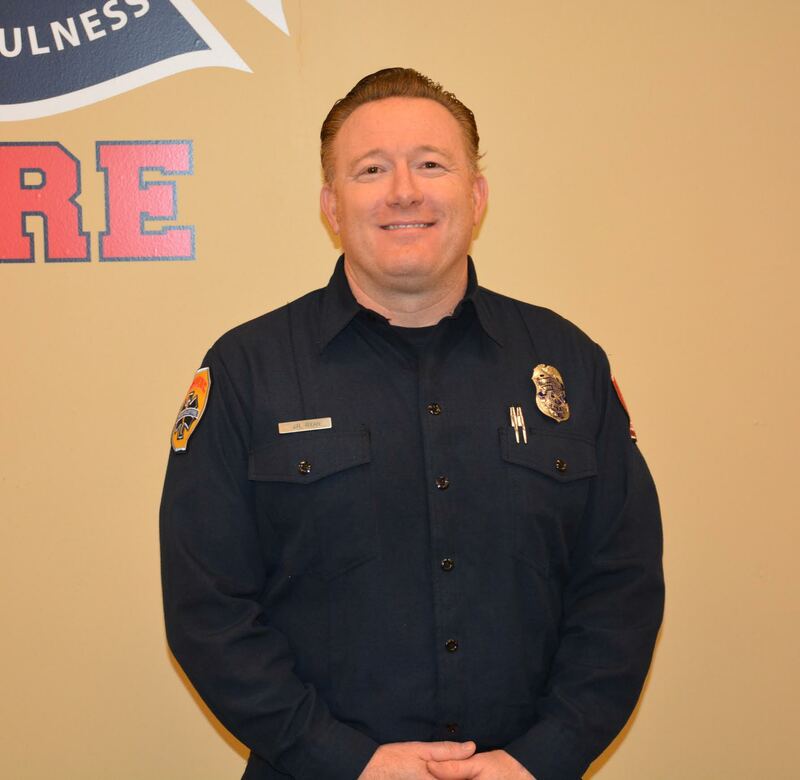 JR was nominated as Firefighter of the Year by his peers for his dedication to the District and ongoing support of personnel in his role as President of the Chino Valley Professional Firefighters’, Local #3522. His positive attitude, professionalism and solid work ethic are commendable. Congratulations JR, on being selected as the 2018 Firefighter of the Year! 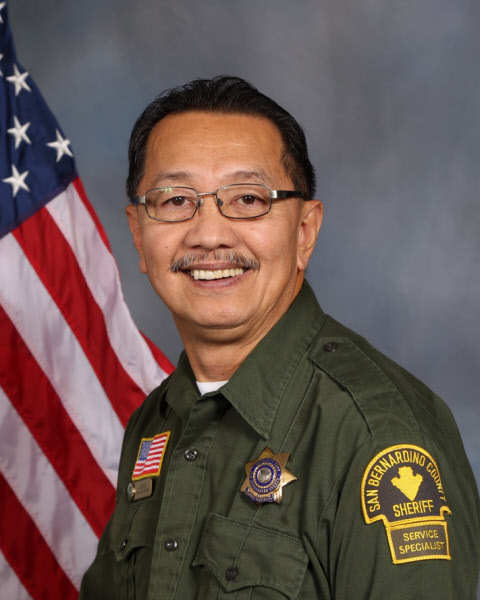 Alex was hired by the San Bernardino County Sheriff’s Department in 1990 and was assigned to Chino Hills Station in May 2008. He has continuously remained a dedicated employee who accepts any task with a positive attitude. Alex gives his maximum effort no matter how big or small the task. He has participated in countless events and conducted station tours. He routinely dresses up as McGruff the crime dog and represents the department in a positive manner. A few of the events Alex assisted with this year were, Red Ribbon Week, St. Jude’s fundraiser at Chili’s Restaurant, and active shooter training at the Community Center. Alex can achieve department objectives in a wide variety of assignments. His current duties include front desk coverage, automotive pool, patrol, and special events. He also serves a mentor for new Sheriff’s Service Specialists. His professionalism, maturity, and kind demeanor assist him in developing positive relationships with everyone he contacts. Alex is a hard-working member of the Chino Hills team and an invaluable asset to the department. 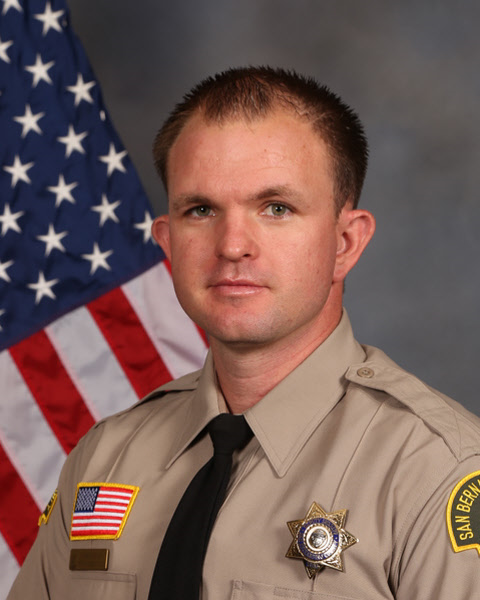 Eric was hired by the San Bernardino County Sheriff’s Department in 2012 and has been assigned to the Chino Hills station since August 2015. 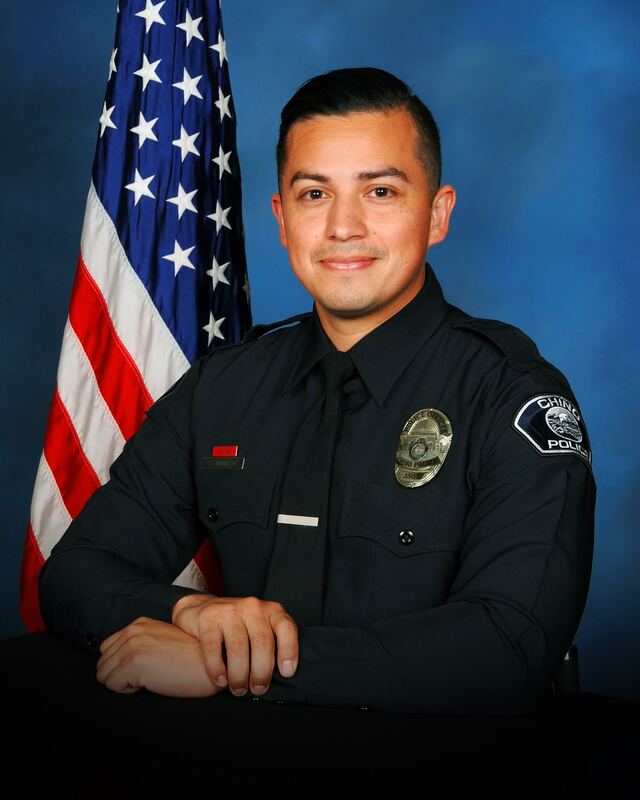 Due to his commitment and passion for law enforcement, Eric received the Top Cop Award/Certificate from San Bernardino County Supervisor Curt Hagman, MADD Certificate of Achievement/Recognition award, and in November 2018 became a Field Training Officer. In the last 12 months, Eric authored approximately 180 reports, issued 70 citations and arrested 93 suspects. In June 2018, Eric conducted an occupied vehicle check and recovered narcotics. Eric gathered pertinent information during the interview and subsequent search of the suspect’s cell phone. Eric authored and served a search warrant for the residence of the drug dealer who provided the suspect drugs. As result of the search, Eric recovered six firearms, counterfeit money, and methamphetamine. Eric is an avid photographer and conducts photo shoots regularly. Eric has used his photography skills to assist the Department. It is because of Eric’s excellent work ethic, decision-making skills, and consistent high performance that he was unanimously selected by his supervisors for the Deputy of the Year award. Officer Amancio has been an officer with the Chino Police Department since 2013. He was previously employed as a Deputy Sheriff with the San Bernardino County Sheriff’s Department. He has a natural ability to discover those engaging in criminal activity. And, more importantly, he is willing to put in the work necessary to hold those individuals responsible for their actions. Officer Amancio was recognized for several outstanding cases in the past year which showed his tenacity as a Patrol Officer to uncover criminal activity. His observations and immediate response led to the arrest of several criminals in his beat. In addition to his crime fighting efforts, Officer Amancio also exemplifies our Chino PD culture through his customer service and community outreach. He is often seen at Community Outreach events such as National Night Out, Citizen Academy, Explorer Academy, Shop with a Cop and Toys for Tots. On more than one occasion this past year, community members that have had Officer Amancio respond to their calls for service have called back to express how impressed they were with his courteous and polite nature, his patience, his kindness, and his compassion. In one instance, an elderly woman was suffering from an episode related to her dementia. Officer Amancio was able to speak calmly to the woman and resolve the situation. The woman’s adult daughter called to compliment Officer Amancio explaining that his efforts were far more successful than her own in trying to calm her mother down. In another example, Officer Amancio conducted a vehicle check. After contacting the occupants, he learned that this family of five, 2 adults and 3 children, were living in their car. Due to the cold conditions, Officer Amancio found them a hotel room and provided out of his own pocket the funds necessary to pay for the room. Officer Amancio consistently leads his team in terms of productivity and he is regarded as a hard-working, professional, and cool-headed. He was selected as the Beat Cop of the Quarter for July -September of 2018 and for all his efforts throughout the Year, Officer Tino Amancio is being awarded Officer of the Year. 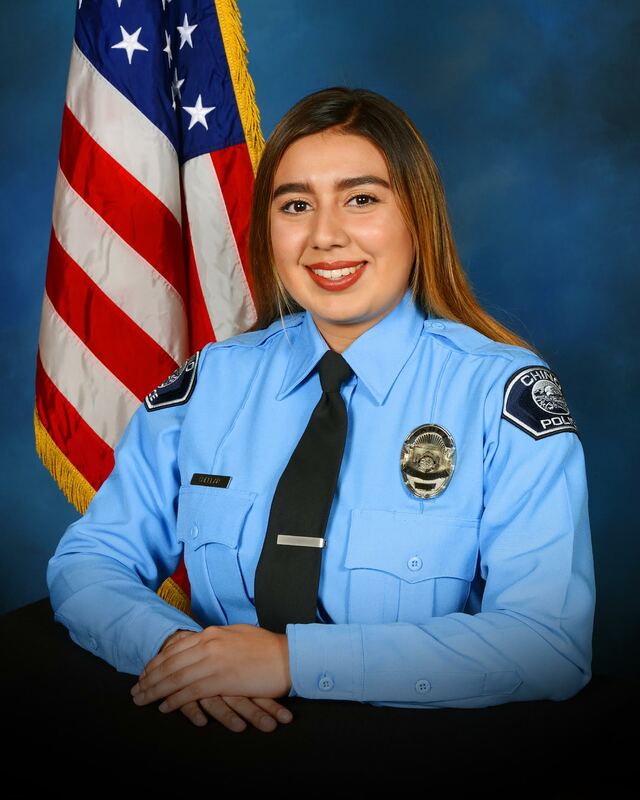 Cadet Vanessa Cuellar was hired with the Chino Police Department in December of 2015. Prior to being hired, Vanessa was a volunteer Police Explorer for 2 years. Over the past year, Cadet Vanessa Cuellar has shown that she is a team player, a leader, and an ambassador for the department. With some changes in staffing to our Training Unit, Vanessa was tasked with new assignments and responsibilities. She took on the tasks of a full-time employee while maintaining part-time hours and attending college full-time. Cadet Cuellar was able to identify shortcomings in processes and has created more efficient and effective ways of completing the tasks assigned to her. Having the responsibility of signing people up for training classes, making travel arrangements, and booking hotels for a Department that places a large emphasis on training requires extraordinary attention to detail. Vanessa has done an outstanding job and has tracked and accounted for every expense. She is not only up to date with this complex assignment but she remains ahead of schedule. Cadet Cuellar is also not afraid to show her vulnerability. When she has a question, she asks. And more than that, she doesn’t just send a quick email. She makes a concerted effort to meet face to face or at least speak over the phone with whomever she is making arrangements for so she can be sure that she has all the information she needs to complete her task. She is an excellent communicator and she fulfills her responsibilities accurately and with excellent customer service. Cadet Cuellar recently showed her leadership abilities when we received a new cadet to the Training Unit. During a transitional period, she would coordinate, train and help the new cadet with her new tasks. In addition to that, she completed her own assigned work, and mentored the new cadet so she would be more efficient and productive. Vanessa not only excels at work related tasks, she also donates her personal time to help others. She regularly helps with the use of force simulator during Citizens Academy and Youth Academy. 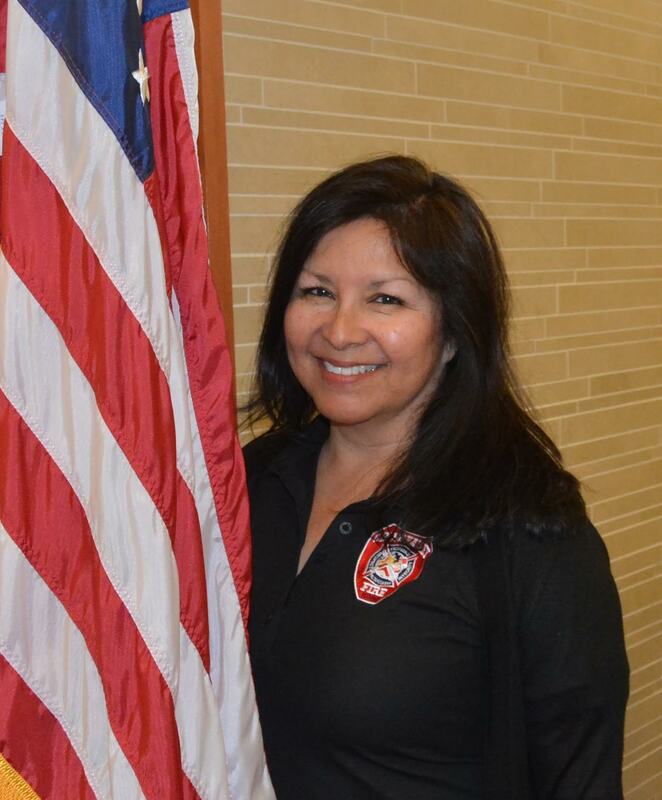 She also volunteers her time with the Explorer program, the Explorer Academy and the Active Shooter Community Workshops. She was also a part of the Cadet Christmas tree give-away where our Cadets delivered Christmas trees and presents to families in need within the city. Vanessa truly exemplifies our Chino PD culture. Please join me in congratulating, Cadet Vanessa Cuellar as our Civilian Employee of the Year. This important event allows the business community to honor and acknowledge the sworn and civilian staff of our three public safety departments: the Chino Hills Police Department, the Chino Police Department, and the Chino Valley Fire District. Thank you to Chino Valley Fire District Chief Tim Shackelford, Chino Hills Police Department Captain John Walker and Chino Police Chief Karen Comstock for giving us the opportunity to honor your agencies at our Salute to Public Safety. As part of our Salute to Public Safety, many officers and staff members received complimentary lunches sponsored by our cities, their departments, and our big-hearted Chamber of Commerce sponsors. Lastly, I would like to thank the wonderful folks who helped put in this years Salute to Public Safety: Arianna Fajardo, Denise Cattern, Gabriela Coletta, Gloria Smith, Margareth Jackson, Massiel De Guevara, Valerie McClung and Zeb Welborn. 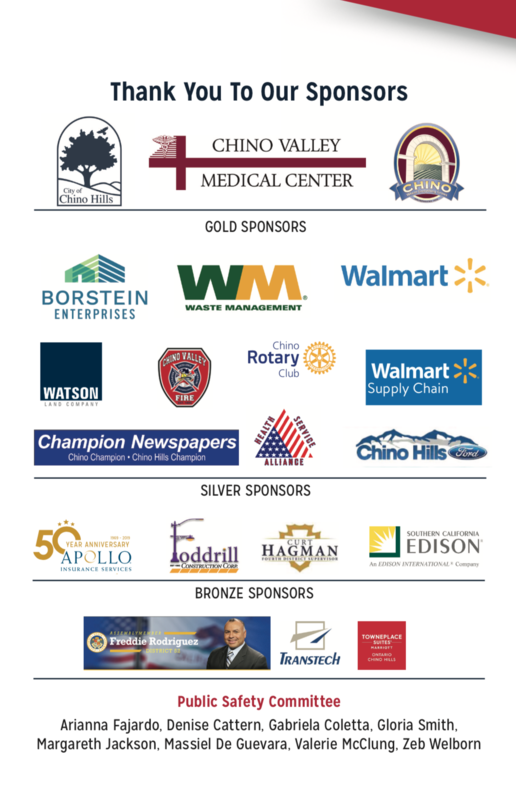 If you or your company is interested in supporting our Salute to Public Safety in 2020, please email me at ZWelborn@ChinoValleyChamber.com. 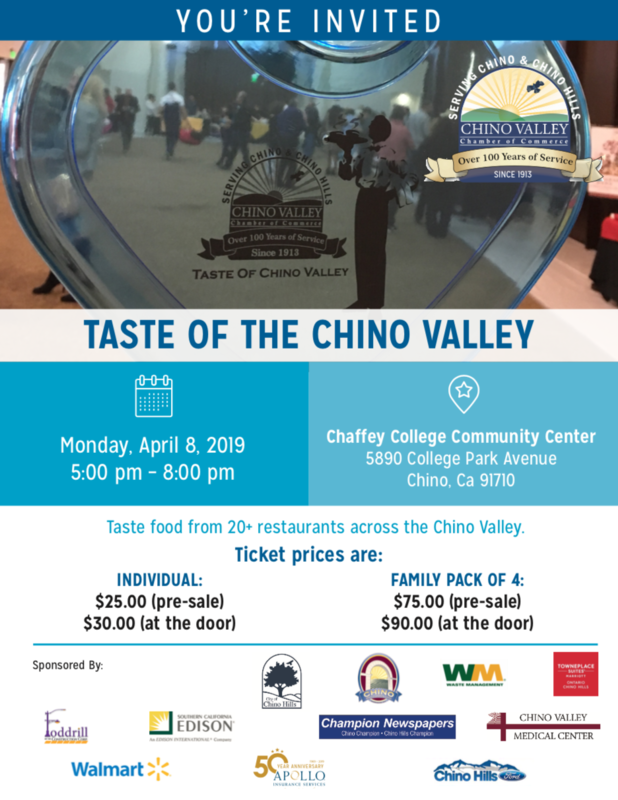 Our next major event is our Taste of the Chino Valley on April 8 from 5pm to 8pm at the Chaffey College Community Center. Taste food from 20+ restaurants across the Chino Valley. Get your tickets today – 2019 Taste of the Chino Valley.